Before completing the steps outline in this article, make sure your domain’s nameservers point to ns1.codero.com and ns2.codero.com. To change your nameservers, you will need to contact your domain registrar (the company you purchased the domain from). Log into ServerPortal.com with your client ID and password. Select Services then DNS Management from the drop-down menu. From the DNS Management screen, click the Add Domains button. In the Add a Domain pop-up window, enter the domain name in the Domain Name text field, then click the [Create] buton. After clicking the Create button, the domain zone will be created. You will be immediately prompted to add the DNS records for the newly added domain. 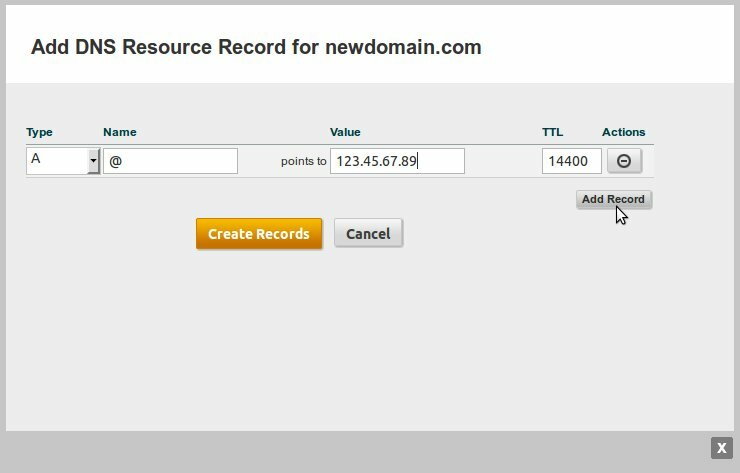 If you know the IP address for the new domain, you can add the zone records now. The most important record is the A (address) record. This record ties your domain name to your IP address. To set the A record, use the @ symbol as the name for the record, then set the value as your IP address. The @ symbol is DNS shorthand for the domain name. You would achieve the same results if you type the full domain name in place of the @ symbol. If you are only adding an A record, click the Create Records button. If you are going to add subdomains (www, ftp, mail, etc) and email to your domain, click the Add Record button. 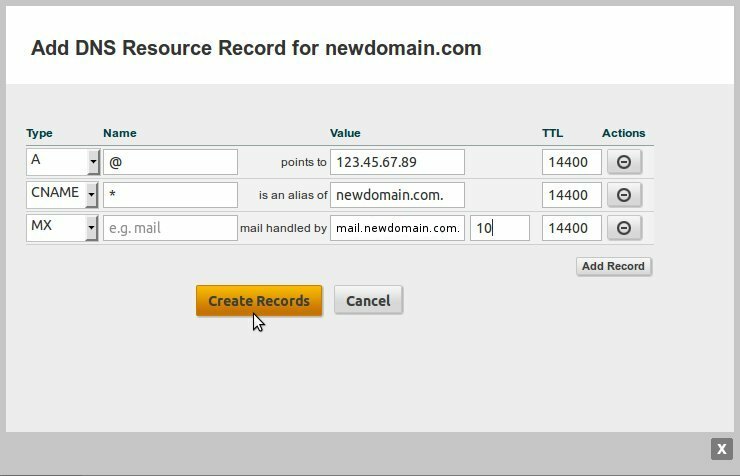 The A record is the only record required to make your domain resolve to your server, however if you intend to use www.newdomain.com, or email, you will need 2 additional records. DFTFD! Don’t Forget The Final Dot! The #1 most common error people make when creating CNAME an MX records is to forget to put a period ‘.’ at the end of the domain name they are trying to resolve to. When typing the domain name in the Value field, it is very important to put a final ‘.’ at the end of the domain name. * IN CNAME newdomain.com. <– Notice the final dot! If you have already saved the record without the final dot, you cannot edit the record to add it. Instead, you will need to delete the record and re-enter it. This is a known bug in ServerPortal.com. 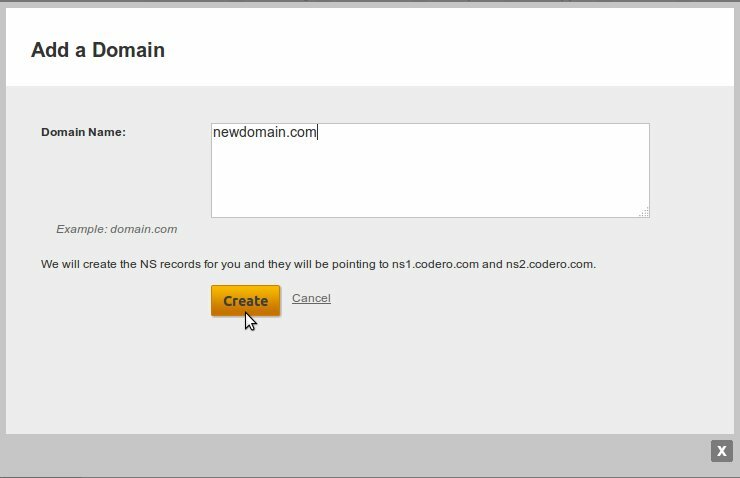 The CNAME (canonical name) record will allow you to use subdomains, such as www.newdomain.com, and points your subdomain to the IP of a domain. To create a wildcard CNAME record, use the * symbol for the name and your domain name as the value. Name = Do NOT enter a vaue in the Name field! You may notice after adding the MX record, the value simply shows mail instead of mail.domain.com. Do not be alarmed by this. This is the standard behavior for ServerPortal mail records. After you have added the A, CNAME and MX records, you’re done! Click the Create Records button to save the records. After creating or changing a zone record, please allow between 4 – 12 hours for the changes to propagate. Do not make changes and expect immediate results!